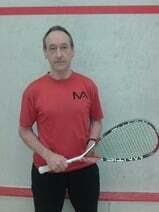 Howard Clark Level 3 Advanced Squash and Squash 57 (Racketball) Coach. As a full time coach I have worked for England Squash, and coach at various locations in and around Nottingham. I am available for individual and group sessions at any level. Bookable in the day, evenings and weekends. I am also a Registered Personal Trainer and Sports Strength and Conditioning instructor training groups and individuals on and off the squash court. I am also a UKRSA professional racket stringer. These are 6 week courses covering all the basics such as correct grip, swing, basic shots, serve and return, moving round the court. The improver course then builds on foundation learnt in the beginner course building on technique and looking at tactics with an introduction to the five pillars of squash. Cost for the courses is £45 not including court fees which will be split between those attending. Please enquire below or visit my website for start of the next course. If you are interested you can register and pay online. Peter Bendall is a qualified level 2 coach. He can be contacted on 0115 925 8474 or email peter.bendall1@ntlworld.com.